One thing that is so rewarding about filming weddings, at least for our studio…is that we feel close to our couples. As we have made it a focus over the past few years to connect with the people in the stories we tell, weddings are special in that we can really just let our couples “do what they do” and simply tell the story as it unfolds. Commercial work can require scripting, pre production meetings, storyboards, and all sorts of other items, but a wedding simply requires us to listen to our couples and learn about them. Pre-production entails meeting up for some food or simply Skyping in and chatting. We LOVE that part. So when we started to learn more about Leslie and Grant, we were not surprised when Grant took the extra effort to meticulously plan out the proposal so that he would ask Leslie to marry him in the exact spot where Leslie would marry him…..if that makes sense? We found it so endearing that not only would Grant make the effort to propose to Leslie at her parent’s home, but that the two decided ahead of time that Leslie’s house would be where they would have the wedding. Again, it should come as no surprise that as grounded as this couple is, they would have their wedding nowhere else….but, home. So with 300 of their closest family and friends together on the grounds where the two have spent much of the past 6 years, we were honored to put together this edit, which was shown last Saturday night, as you see it before you. From the big “Yes!” just over a year ago, to the “I Do” on Saturday, here is Leslie and Grant’s Same Day Edit. A HUGE shout out to Danny Farrell from NYC DJ’s for his help in making the presentation go off without a hitch at the reception and another nod to Josh Elliot from Josh Elliott Photography for being so much fun to work with! There are few times throughout the year where we get to give back and really see the power of telling a story and how that connects with so many people. While today’s post won’t necessarily relay how many others have connected (that post is coming VERY soon), The Pet Rescue Center of Orange County has given us the opportunity to tell a few unbelievable stories. While we are jaded by the narratives and truly feel passionate about each and every one of our projects, the true reach of a story is told by how many people outside our studio can connect with the message. For those who have experienced pet adoption first hand, we need not explain…..but, if you are considering pet adoption, then you MUST watch this film. Doe’s story is incredible on it’s own. Once you add Cheryl into the mix, there is no denying that fate exists. We could write about this edit for hours, but as we typically do…..let the story be told the way it is always meant to be told….press play below…..and then go adopt your next pet. As we just passed Martin Luther King, Jr. Day just a couple weeks ago, we find a link between one of his more famous quotes and Krissi and Clark’s persona. We are not alluding to Krissi and Clark’s ultimate prosperous future in street sweeping…..though you never know where life will take you, right? All kidding aside, what is being said in this quote is to dedicate your mind and heart to being the absolute best at whatever it is that you do and this is the encapsulation of Krissi and Clark. The very first thing that struck us about Clark was his three piece suit….at all times. Our first meeting at the studio, our dinner just weeks before the wedding….three piece suit…always coming from work. This man is passionate about what he does, almost to a fault. But, you can see that his intensity is paying dividends and he won’t stop until he is the king of his niche, and we love that about him. In many ways, we empathize with him….not that we rock suits to our gigs, but success requires sacrifice and Clark inspires us to push the limits of our filmmaking further just by seeing how passionate he is about “killing it” as he will tell you “at what you do”. Krissi is equally as passionate about Clark, their relationship, and the family bond that ties everyone together. Her support of his dream while laying the foundation for their marriage will solidify them as one powerhouse moving forward. You can see how passionate Krissi is about Clark and their future together. This is not to say there is any lack of love going the other direction….oh no…we grabbed Clark rehearsing his handwritten vows and holy teary eyes….well…come see for yourself. A HUGE shout out to our pals Katie and Meghan from Intertwined as they put together one heck of a shindig just days after the New Year rang in. We love the two of you and your ever-talented team of event planners! Also, big love to Jasmine Star for putting up with our relentless flow of poor humor throughout the day 🙂 Always fun to work with familiar faces who, like Krissi and Clark, are intent to be the kings of their niche. Well, Happy New Year!!! 2013 was incredible for the studio and we absolutely sucked at posting and keeping you updated on the latest happenings towards the back end of the year. Before everything gets crazy again, we wanted to get this post up in The Fray to share one of the highlights of 2013 with you. If you followed along on our Facebook page, you may have seen several photos from the set during the filming of this project……and here it is! Giving back is a big part of our studio and where a lot of our passion for filmmaking stems from. There is no greater reward than taking time out of a crazy production schedule to work towards a great cause and help to use your craft to give back to an organization that helps others. For over 25 years, Santa Margarita Catholic High School has been serving their “community of learners” as they like to call them. SMCHS was in need of a new admissions film as they are a private school and as such they have to go out and seek their future student body. So, we setup the meeting to chat further about the project. “The biggest challenge”, as Ron Blanc (SMCHS Admission’s director) referred to it, “is that we need this film to appeal to 8th graders and their parents alike.” Well, we love challenges and we were confident that if we stuck to the story of SMCHS and why their school is different from others, we could appeal to the two very different audiences. A very special thank you to Kelley and Paul Gilster from 618 studios as they played a big role in the filming of all the interviews. Two very challenging and long days of filming all around the campus, not to mention we managed to find rain in Southern California in July…..when we had an outdoor shoot scheduled. …and of course, a couple fun Behind the Scenes shots from the pool sequences…. 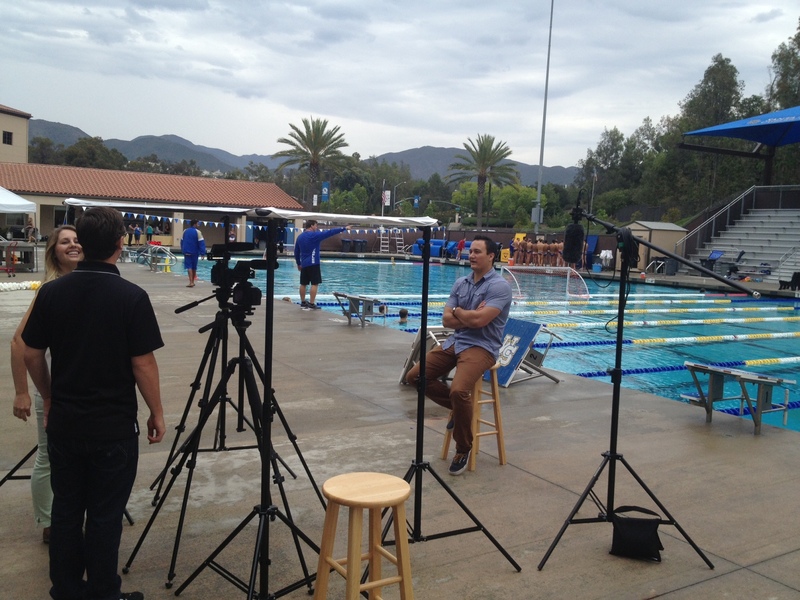 a makeshift umbrella over the camera as we filmed Grant’s outdoor interview in front of the pool. 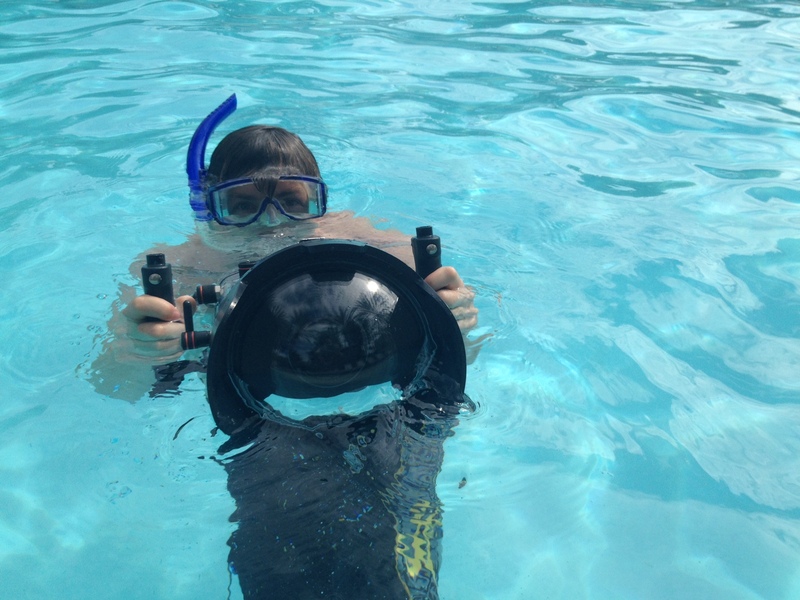 Ben ready to go with the underwater housing for the pool visuals. Grant on the starting block waiting for the cue to jump into the pool as Ben prepares to film in the pool.